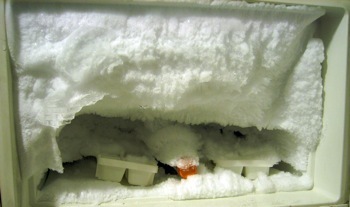 Opened the freezer today while looking for a thermometer. Guess it has been neglected a bit! I don’t go to the grocery store and really only use the fridge for drinks every once in a while. A different lifestyle than suburban-Shawn. The Ziegfeld theatre has been showing old Bond movies the past two weeks. I went to “Dr No” and “From Russia With Love” last weekend. It was the first time I’ve been to the Ziegfeld, and it was great. It’s a huge old-style theatre. Maroon felt-covered walls and gold painted wood. Happy! I’ve decided to not keep around old bottles of wine any more. Ideally, I’d like to keep about a case worth of mixed wine for special occasions. I currently have 4 bottles of special-occasion wine that I’d actually drink. The others are of “questionable provenance”and I don’t want to risk trying to drink them. The problem is that any wine refrigerator of this size isn’t really made for long term storage. At the size that I’m looking for, they are also extremely shabby. They don’t seem to make a high quality wine refrigerator for under 30 or so bottles. I used to have a 35 bottle refrigerator, but that was too big for the NYC apartment. I’ve thought about it, and I think that is the trend I want to follow. I think the idea of the storing a special-occasion wine is a suburban idea. Special bottles, like these, take time to get a hold of. And space isn’t that expensive, so it makes sense to stock up. In NYC, on the other hand, space is at a premium and coincidentally, I can buy any wine I’d want just a few blocks from here. If I wanted a Lafite or a d’Yquem Sauternes, Morrel has it. At the moment, they even have an Unico. (I carried 2 Unico’s from Spain when I visited a few years ago) Now the only problem is, what do I do with the current store of special-occasion bottles? I was thinking of just drinking them over the next couple weeks. (I just reclaimed them from Trevor R’s wine fridge after storing them there for quite a while) I don’t know if I can convince myself to drink almost $2K worth of wine in such a short amount of time! I’ll be trying to convince myself over the next couple of days. What are the alternatives?